Reggie's Ramblings: Want to know why you computer is slow to boot? Ask Soluto! 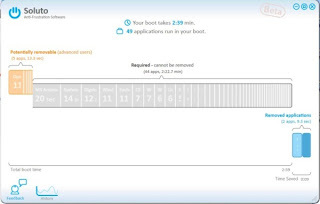 Soluto is a brand new company and product that aims to take the guess work out of determining what is making Windows slow to boot. We've all got moms, dads, brothers, and sisters who call us up on some Saturday and ask us to look at their computer and speed it up only to find it loaded to the gills with toolbars and "ink reminders". Now with Soluto, they can just install the slick program, reboot their system, and let it do the work. It uses a kernel-driver along with a database of applications and user experiences they have collected to determine what an application does and make recommendations to you. I installed it but it found little it could do to speed up my system. I have already trimmed almost all the fat from my rig. Here's a shot of the UI. You can hover over this timeline of your boot and it will explain each element, what it does, and give you a recommendation as to pausing (not starting) or delaying (start on-demand). So the next time uncle Bob calls and wants you to speed up his computer, just send him to Soluto!